I am proud of myself for having dug up this coffee shop, set in the upper Bit Pazaar area. I was walking, face down to avoid eye contact with the sun, when interesting music roused me from the apathy. And there it was, a place that smelled of freshness, which earned a fair place in my must-visit list. Pikap holds a simple design with repurposed furniture and objects. The bar is covered with tiles and is topped with wood. A modular DIY construction of old storage boxes serves as storage for the alcohol. Besides the ground floor, there is a loft in which you can find second hand clothes and vinyls for sale. At midday, it is the perfect time to relax on the leather sofa and enjoy being bathed in sunrays through the glassy storefront. Nights in Pikap, however, are rather vivid. The schedule is filled with organized theme nights as well as DJ sets of various types of music. 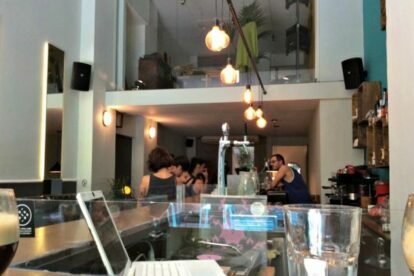 The bar works with self-service and there’s a lot of chatting and dancing in a cheerful atmosphere. If you have pets, it might be interesting to know that Pikap’s team also has strong pet-friendly feelings. Pets are allowed indoors and there are dog bowls with water next to the entrance. If you are pet owners or pet enthusiasts like me, you will find this gesture adorable. Sometimes, it’s all about these little things that make you think some spot is special!